Eighth grade students have been learning about Asirei Zion in their Hebrew class. They learned about the struggles of Jews in the Soviet Union and how Jewish organizations and individuals around the world held protests for their release. In addition, they learned about the protests that were held around the United States every Sunday in which protesters wore wristbands with the names of Asirei Zion. Following the principles of inquiry and project based-learning, students chose to research one Asir Zion. 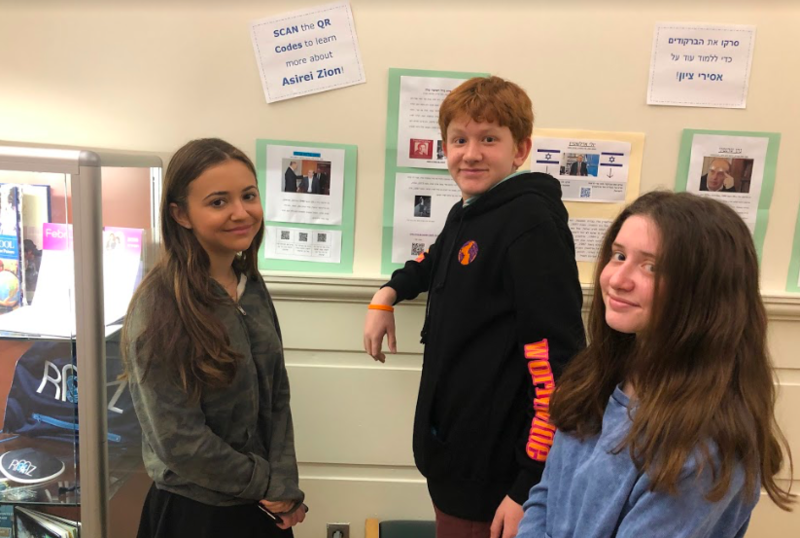 Students chose to learn more about Natan Sharansky, Yuli Edelstein, Ida Nudel, and Mark Dimshitz. Each group engraved the name of their Asir Zion on a silicon wristband. As a final project, students made an interactive poster - posters in which readers can scan QR codes that link to various sources of information. For example, one group of students created a QR code that links to a video about the life of Natan Sharansky. Another group created a QR code that links to Yuli Edelstein's profile page on the Knesset website.